Why I chose Lichtenstein was because i'm a fan of pop art. Fell in-love with it(pop art) when I went to an Andy Warhol exhibition. Love how pop art employs aspects of mass culture, such as advertising, comic books and mundane cultural objects. Roy Fox Lichtenstein (October 27, 1923 – September 29, 1997) was an American pop artist. During the 1960s, along with Andy Warhol, Jasper Johns, and James Rosenquist among others, he became a leading figure in the new art movement. His work defined the basic premise of pop art through parody. Favoring the comic strip as his main inspiration, Lichtenstein produced hard-edged, precise compositions that documented while it parodied often in a tongue-in-cheek manner. His work was heavily influenced by both popular advertising and the comic book style. He described pop art as "not 'American' painting but actually industrial painting." His paintings were exhibited at the Leo Castelli Gallery in New York City. Whaam! 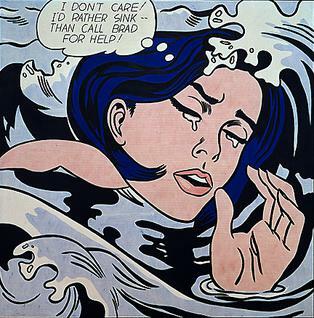 and Drowning Girl are generally regarded as Lichtenstein's most famous works, with Oh, Jeff...I Love You Too...But arguably third. Drowning Girl, Whaam! and Look Mickey are regarded as his most influential works. Woman with Flowered Hat has held the record for highest Lichtenstein auction price since May 15, 2013 although that was recently beaten in 2015 by Nurse.